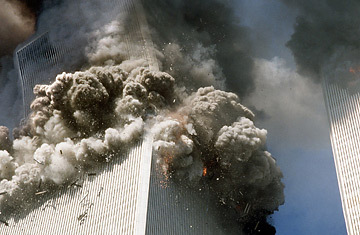 The south tower of New York's World Trade Center, left, begins to collapse after a terrorist attack on the buildings as shown in this Sept. 11, 2001, file photo. At a time when Congressional Democrats are trying once again to pass a torture ban, it's a given that the revelation is going to further inflame the torture debate  since the tapes apparently showed harsh interrogation techniques. The assumption will be that the CIA did not want the tapes seen in public because they are too graphic and could lead to indictments. But more to the point, the revelation will raise another question: What other evidence has the CIA destroyed? And can the CIA be trusted to tell us? The CIA had told the 9/11 Commission, when it formally requested such materials, that there was no taping of interrogations. CIA lawyers also told federal prosecutors trying the Zacarias Moussaoui terror case that the agency did not possess recordings of interrogations sought by the judge and Moussaoui's defense lawyers. The CIA insists that the tapes destroyed were not the ones in question. I would find it very difficult to believe the CIA would deliberately destroy evidence material to the 9/11 investigation, evidence that would cover up a core truth, such as who really was behind 9/11. On the other hand I have to wonder what space-time continuum the CIA exists in, if they weren't able to grasp what a field day the 9/11 conspiracy theorists are going to have with this  especially at a time when trust for the government is plumbing new depths. I myself have felt the pull of the conspiracy theorists  who believe that 9/11 was an inside job, somehow pulled off by the U.S. government. For the record, I don't believe that the World Trade Center was brought down by our own explosives, or that a rocket, rather than an airliner, hit the Pentagon. I spent a career in the CIA trying to orchestrate plots, wasn't all that good at it, and certainly couldn't carry off 9/11. Nor could the real pros I had the pleasure to work with. Still, the people who think 9/11 was an inside job might easily be able to believe that Abu Zubaydah named his American accomplices in the tape that has now been destroyed by the CIA. It isn't going to help that the Abu Zubaydah investigation has a lot of problems even without destroyed evidence. When Abu Zubaydah was arrested in Pakistan in 2002, two ATM cards were found on him. One was issued by a bank in Saudi Arabia (a bank close to the Saudi royal family) and the other to a bank in Kuwait. As I understand it, neither Kuwait nor Saudi Arabia has been able to tell us who fed the accounts. Also, apparently, when Abu Zubaydah was captured, telephone records, including calls to the United States, were found in the house he was living in. The calls stopped on September 10, and resumed on September 16. There's nothing in the 9/11 Commission report about any of this, and I have no idea whether the leads were run down, the evidence lost or destroyed. If this sounds like paranoia, it is. But the CIA certainly is not helping by destroying evidence. And they should know better than to destroy evidence in the biggest criminal case in American history. More than anything what we need right now is complete and total transparency on 9/11.